What’s a new shmup without a new hook, though, right? 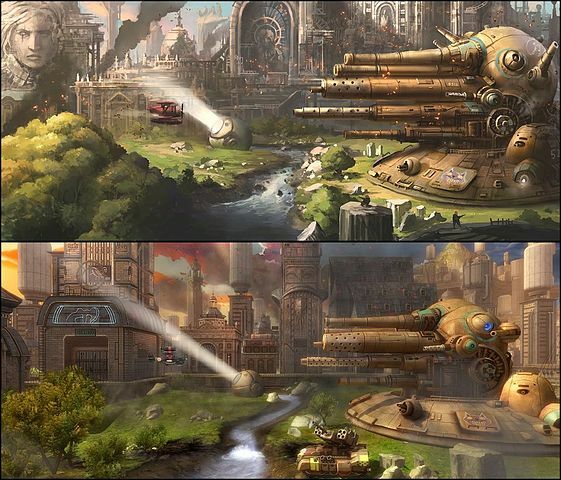 Sine Mora is well aware that contemporary games don’t quite have the memorization or bitter edge that old school titles employ. Furthermore most shmups that still release have that traditional difficulty, which may be one of the contributing factors to poor US sales, so it remains safe with its difficulty. Instead of lives or a life bar, you are given a time limit that is constantly counting down and each hit you take reduces that timer even more. This dynamic means that even if you’re flying through bullets, this is tactically feasible provided you’re going full fledge for the end goal. As a game that touts itself a danmaku shmup, a slowdown mechanic also assists in weaving in and out of the game’s complex bullet patterns (especially with bosses). Mechanics like these make the game sound too easy, it’s really not. Your timer will countdown faster than you can imagine and a persistent slowdown bar ensures that if you waste your ability to slow time early on, you won’t have it later (it does not regenerate but you can collect small blocks of time). Despite the ease of navigating the main campaign, this game can quickly become tough as nails with its scoring. Hidden behind a manageable campaign lies a true, score-based challenging game that doesn’t want you to come in contact with a single bullet. Each level will rate you based on your performance, including amount of times hit and overall score. If you kill a large batch of enemies without taking a hit, your multiplier will increase with a maximum of 5x the points, but every time you slow the world down or take a hit that returns to 1. Sine Mora features a traditional cannon and secondary attacks akin to bombs in other shmups – but using a secondary fire will also kill your multiplier. Doesn’t sound like much of a task when navigating some early levels but it’s a bear on even some of the early boss battles. After completing the campaign you open the ability to play arcade mode, which allows you to skip the story and play specific levels with various difficulties and ships. There’s also score mode, which challenges you to get the highest score on a single life and what shmup would be complete with out a boss rush mode to teach you the intricacies of the game’s biggest baddies. Next thing you know, you’re replaying levels hundreds of times, memorizing spawns and freaking out over a single hit – this hurts even more because in Sine Mora you don’t die. With Microsoft publishing the title digitally, Sine Mora is a 1200 point ($15) Xbox 360 exclusive that I feel is quite moderately priced when compared to other contemporary shmups. It is a decent starting point for those entering into the genre and it can be just as brutal as some of the best Cave and Treasure shmups around if you hike the difficulty and set personal goals. I wasn’t sure what to expect out of this game, but aside from some minor gripes about pointless deaths because the game isn’t clear on what you’re supposed to do, it delivers on all fronts. A new shmup has been born in Sine Mora and fans of the genre owe it to themselves to pick this gorgeous addicting title right away. Whew, well that basically wraps up Shmuppreciation month save for tomorrow, the final day, where I will discuss an indie shmup for light reading. Come join us for the final installment of Shmup of the Day with a Dreamcast indie title appropriately titled Last Hope.